Super comfy and warm, this over sized shrug is a must for your fall and winter wardrobe. The shrug is crocheted with a striped eyelet pattern to create a fabric that drapes easily, has textural interest, and is still surprisingly warm. The solid border is used to contrast the lighter eyelet pattern. Instructions for adjusting the shrug to any size or fit is included within the pattern. 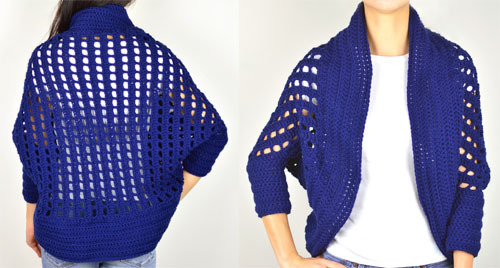 Whether you’re an extra small or plus size, customize this shrug to your liking. This entry was posted on Monday, November 6th, 2017 at 12:00 AM by Rachel Choi	and is filed under Best Crochet Patterns. You can follow any responses to this entry through the RSS 2.0 feed. You can skip to the end and leave a response. Pinging is currently not allowed.